On 10th and 11th August our very good friends from the Essex Wildlife Trust will once again be here at the farm with displays and information on their important work and their nature reserves, nature parks and information centres. 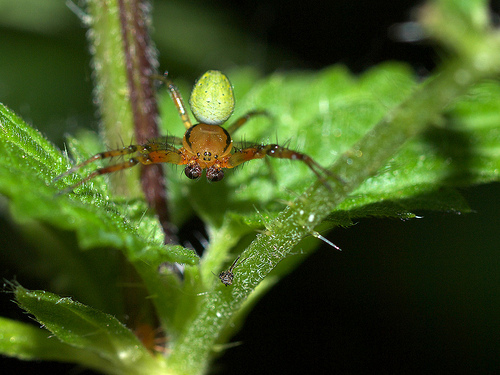 They run a fantastic 87 nature reserves, 2 nature parks and 8 visitor centres, 25 of which are within 15 miles of Brentwood, which provide protection for some of our rarest species of animals and plants. These reserves give people the opportunity to enjoy and appreciate the rich variety of habitats which were once widespread in our counties. Essex Wildlife Trust is one of 47 local trusts which form The Wildlife Trusts network, dedicated to the achievement of a United Kingdom richer in wildlife. The Wildlife Trusts collectively care for more than 2,400 nature reserves and between them have more than 800,000 members. 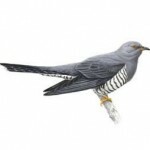 For further information please visit www.essexwt.org.uk or better still meet them when you visit the farm in August. By the way, the above photo from the Essex Wildlife Trust website was taken by Gary Jacobs and is of Packham the Barn Owl. Other images are below also from their website. The Royal Society for the Protection of Birds (RSPB) is Europe’s largest wildlife conservation charity with more than a million members and almost 20,000 volunteers. 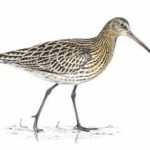 The organisation is dedicated to saving birds in Britain and overseas. Now we are delighted to say that RSPB South Essex Marshes will have a display at our farm on the 14th and 15th July, so it is well worth a visit to have a look at their stand, and of course visit our farm too! Entrance to the RSPB Visitor Centre and Discovery Zone is free, although a small charge applies to guided walks and some children’s activities. Contact the Visitor Centre for details of events, dates and charges. The site is very good for birdwatching all year round with a free guided walk each Thursday around the park from the visitor centre. There’s always something going on for families in the Visitor Centre. Watch the birds in the wildlife garden, discover minibeasts in the aquarium, follow the seasons on the live CCTV cameras or at weekends have a go a nature-themed activities. There are also monthly RSPB Little Owls (0-5 years) Wildlife Explorers (7-11 years) and Phoenix (11-18 years) clubs. Dogs are allowed anywhere. Contact the Country Park for more information. 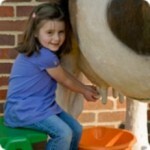 However your best bet is to visit Old Macdonald’s Farm on 14th and 15th July. 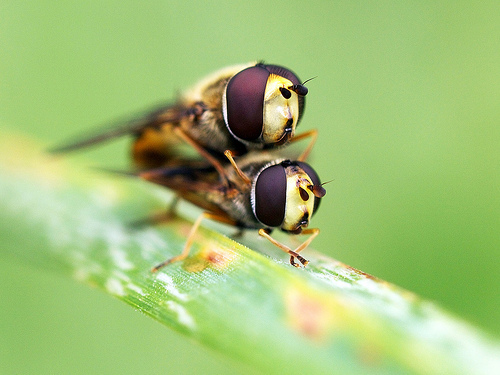 Now here are their top tips for what to do in the spring on the Marshes. October Half Term, Old Macdonald Hits the Road with his Country Fayre. 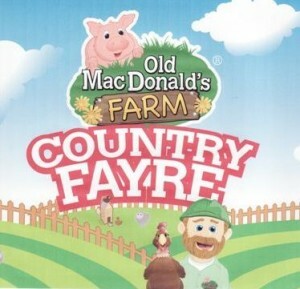 This October Old Macdonald is thrilled to take the pleasure of his farm out to east London so he will be opening Old Macdonald’s Country Fayre in Barking Road Recreation Ground in Newham. Open during the half term week, 27th October to 30th October, each day from 12 noon to 7 pm this is a taste of the country coming to the heart of the east end, and we thank Newham Council for agreeing to host this festival of family fun. Pay just £1 entry and you can come and meet and greet our farm characters as well as enjoy the Duck Race, Milking Cow, singing chickens and craft workshops for no extra charge (and the ducks, cow and chickens are not real so do not worry about their health, but they are great fun) as well as take part in craft workshops. 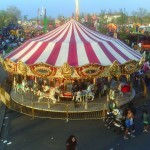 Then, if you wish, you can buy tokens and enjoy lots of fun activities for children and their parents, such as the Wacky worm coaster, Pony Ride, Old Mac’s Tornado, the farm Merry go round, Swan Lake, the farm train and the children’s waveswinger and flying jets. Old Mac has laid on special family rates too so you can either buy tokens for just 50p each or save 25% and buy £25 worth of tokens for just £20. Plus, every visitor will receive £10 off voucher for a child with a paying adult when they want to visit Old Macdonald’s Award Winning Farm in Brentwood, home of TOWIE and Old Macdonald too. 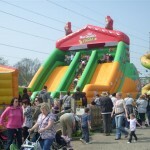 Great value, great fun, see you in Barking Road Recreation Ground. 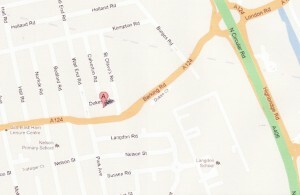 The postcode is E6 2LW and Barking Road is between East Ham and the Barking A406 flyover. On September 24th you will find some strangely dressed people in Brentwood High Street. Actually you may well find some any day, see TOWIE for example, but on 24th September they will be in period costume as the town celebrates its long, illustrious and occasionally bloodthirsty history for the very first time. This features the Martyr’s Walk. 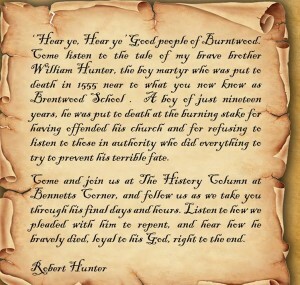 The production consists of professional actors and is based on the story of William Hunter, a Protestant who was burned at The Stake in Brentwood in 1555. The production forces audiences to question whether the 19-year-old, who sacrificed his life rather than his God, was a martyr or if he was simply misguided. It is estimated to last 50 minutes and starts by the History Column at Bennetts Corner, then pilgrims will lead on to the Chapel Ruins where William is challenged about his choices. It will also visit the scene of the “crime” where William read his English Bible and highlight the meetings and trials. The third location is the Martyr’s Tree, and the final scenes of William’s horrible death are on Shenfield Common. Penelope said: “The whole idea of the show is to instigate a debate about whether he was a martyr or was just misguided. It is something that is long over due and hopefully people will enjoy it.” Audiences should meet at The History Column, Bennetts Corner, Brentwood. All this happened during the reign of Bloody Mary (who at that time was a Queen of England but now of course a drink! How times change.) So what, you may ask, are the other key moments in the town that should be considered on that day? Well, there is the 12th century ruin of Thomas Becket Chapel which was a popular stopping point for pilgrims on their way to Canterbury. 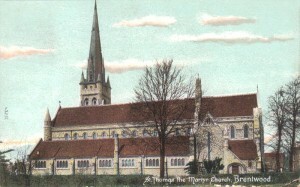 Our image at the top of the page is the church of St Thomas the Martyr, built in the early 19th century in the town to continue the tradition. Brentwood was a meeting place for the Peasants who were revolting in the 14th Century and they, including their leaders Watt Tyler and Jack Straw who is still on TV quite a bit, gathered in local pubs and inns. Moses Drayne, an Ostler, was hanged at Brentwood in 1667 for the Murder (by a Chelmsford Innkeeper and his Family some Years before) of Thomas Kidderminster, a Guest. Fortunately the Hotels in Brentwood are significantly better than this now. Then we had Thomas Munn, ‘gentleman brickmaker’ of Brentwood, who was hanged in 1750 for robbing the Yarmouth mail and his body was exhibited in chains at Gallows Corner near Romford. Suppose if you are going to hang people, Gallows Corner is a pretty good place to do it. Hangings and burnings then, Law and Order rules here for sure. In the early 18th century, Daniel Defoe wrote that Brentwood was a place of fine inns and taverns, so TOWIE has a fine and long history too. On Thursday 19 September 1850, at just before 8am, a dreadful accident occurred at Brentwood and nine railway workers were killed. On the morning of the accident it was very foggy with visibility no more than 40 yards and steadily decreasing. Just by the Seven Arches Bridge on the Brentwood to Shenfield stretch of the ECR, twenty five men were working on track maintenance. Ballast had been brought up the line on a number of trucks and had been tipped out between the two tracks. The gang were working on the down-track spreading the ballast between the sleepers. The ballast train was stationary on the other track – but as the driver Edward Muirhead later stated, the engine was very noisy. Thomas Coldwell, the foreman of the gang was aware that a train was due to pass on the down-line yet no look-out had been posted. Suddenly, looming out of the fog, not less that 50 yards away was a passenger train coming towards them. Thomas Chalk, one of the gang shouted out a warning “The train is coming. Get out of the road, chaps”, but because of the noise of the ballast engine not all of them heard this. It struck the men and killed nine of them instantly. So remember those whose lives were lost building services that we today take for granted. So, on September 24th, why not join in this historical re enactment before you come down and visit us on the farm, and you can also pop up the High Street, enjoy the shops and centres, book tickets for Brentwood Theatre who are hosting the start of this parade, and join in the celebration of this town, the next best thing to London. We may not be historic here, only 16 years old, but you will have a hysterical time and can learn of the history of farming in Essex and the background of your favourite farmyard friends. Love Your Zoo Week Coming Soon-30th May. This year for the first time, BIAZA (the British and Irish Association of Zoos and Aquariums) is staging “Love your Zoo Week” when we, and other members, will be staging special activities for visitors to enjoy, and as this co incides with the late Spring School Holiday Half Term is is a wonderful time to visit us at Old Macdonald’s Farm and meet our collection of farmyard favourites and exotic animals, and we will be launching Old Macdonald’s Fascinating Facts Trail around the farm, so you can learn about the many exciting creatures you meet (not the staff, even though they are quite exciting). Also there will be special opportunities to meet and pet some of your favourites throughout the day, and finally on June 5th we have our annual Starlight Day where we raise money for children who are seriously ill and their families through our favourite children’s charity. 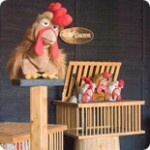 More news to come on this website and on www.omdfarm.co.uk as we get nearer to the week.